(Nanowerk Spotlight) The prospect of stretchable electronics opens some exciting possibilities – for instance, think about artificial skin with an integrated, stretchable touchscreen display. To get there, researchers have begun developing elastic electrical wiring that is both highly conductive and highly stretchable. Currently existing stretchable materials do already exhibit excellent conductivity and mechanical stretchability but they have one major disadvantage: their manufacturing processes are not readily scalable, which means it is difficult or cost-prohibitive to apply them to large-area electronics. 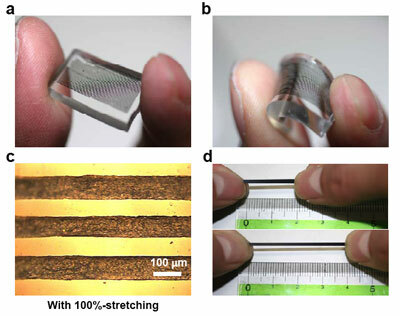 A research team in Japan has now successfully fabricated, for the first time, novel elastic conductors that can be directly patterned by printing processes. This novel, printable elastic conductor comprises single-walled carbon nanotubes (SWCNTs) uniformly dispersed in a highly elastic fluorinated copolymer rubber. "Our printable elastic conductor can be used for stretchable wires and contacts in electrical integrated circuits," Takao Someya tells Nanowerk. "As a demnstration, we have integrated these printed elastic conductors with organic transistors and organic light-emitting diodes to realize a truly rubber-like active-matrix organic LED display. A 16x16 grid of transistors was used for driving the display and the effective size of the active matrix was 10x10 square centimeters. The display could be stretched by 30-50% and spread over a hemisphere without any mechanical or electrical damage. Furthermore, it remained functional even when folded in two or crumpled up, indicating excellent durability." Someya, a professor in the Department of Electrical Engineering at the University of Tokyo, together with his collaborators, has reported elastic conductors before (A Rubberlike Stretchable Active Matrix Using Elastic Conductors), but the materials were incompatible with printing due to low-viscosity and reaggregation before drying and, furthermore, it required an additional rubber coating to improve elasticity. The new material – which can be printed in the spatial resolution of 100 micron or less and requires no additional coating – exhibits the highest conductivity reported for a stretchable conductor so far. It can be stretched by more than 100% and, more importantly, it has an extraordinarily high conductivity of 102 siemens per cm that changes negligibly with stretching. Someya explains that the fabrication of the new elastic conductor becomes possible because his team has successfully established a novel process that allows them to uniformly disperse finer bundles of SWCNTs as conductive dopants among a rubber matrix without shorting the length of nanotubes during the processes. "In this way, longer and finer bundles of SWCNTs can form well-developed conducting networks in rubbers, thus significantly improved conductivity and stretchability," he says. "This situation also realizes printability of this material since SWCNT-rubber composite gels become increasingly viscous, which is well suitable for high-definition screen printing." The researchers patterned the SWCNT paste on rubber sheets made of a silicone elastomer using screen printing through shadow masks and then let the, what they called "buck gel" air dry. "The resolution is currently limited by the adhesion between the SWCNT paste and the rubber sheets," says Someya. " But the stretchability can be enhanced when printed elastic conductors are sandwiched between rubber substrates because encapsulation prohibits the elastic conductors from delamination." He points out that miniaturization of display cells for a higher resolution is one of the most important requirements. Using screen printing, the team has already successfully patterned printable elastic conductors with line widths of 100 µm. "However, screen printing can be used to pattern pastes to resolutions of 10 µm" says Someya. "Organic LEDs can be manufactured using printing technologies, and furthermore, printing technologies of organic semiconductors and electrodes with resolutions of 1 µm have been reported." Although the current layout of the stretchable display that was fabricated was monochrome, full color displays are possible. Someya estimates it will take about five years to commercialize stretchable displays and that there will be a wide range of applications that will benefit from this new technology, significantly expanding the areas where electronics can be used. "The printable elastic conductor that we developed enables the construction of electronic integrated circuits that can be spread over any surface, including arbitrary curved surfaces and movable parts," he says. "This is an important step towards the development of the infrastructure for the imminent era of ambient electronics, in which a multitude of electronic devices such as ambient sensors, actuators and display networks function as user-friendly human machine interfaces that can be used in daily life to enhance security, safety and convenience." The scientists have reported their findings in the May 10, 2009 online edition of Nature Materials (Stretchable active-matrix organic light-emitting diode display using printable elastic conductors).